Followers of my blog will know my respect for the mostly unremembered work of George Tuska in the fifties. 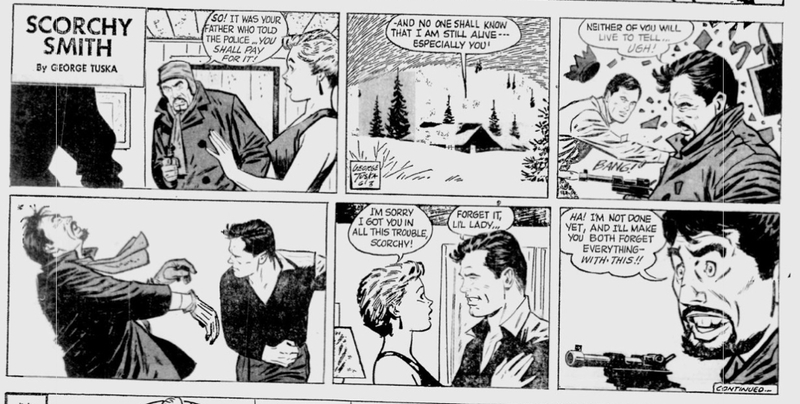 I think he was at the pinnacle of his Caniff inspired style, doing the kind of strips he did best before being forced into the superhero mold (which he did very good as well, being the consumate artist he was).If anything is remembered from this period it is not the many short stories and fillers he did for various companies, including Timely/Atlas and Prize (many of which I have shown on this blog) or his long and uninterupted run on Scorchy Smith. He did the dailies from 1954 to late 1959 and Sundays from the same starting point up until they ended in 1956. In fact those were so unknown that I belie=ve I was the first one to poitnt out they excisted ánd that they stopped halfway through the run. I have never seen a color Sunday in my life, but have shown what I could find of the Sundays in black and white. Some of those are included here as well, because this is a maga dum of everything I have got. 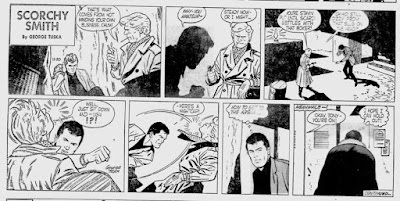 He took over the dailies from A. C. Hollingsworth, which are just as rare (never seen a color Sunday, although at least originals survived) and ran well into his start of his next, slightly better remembered strip, Buck Rogers. I included the first installment of his successor, John Morris. Several notes that can be made. First of all, I may have noted before, but George simplified version of Caniff's style may have preannounced the shrinking of comic strips. As we look back, we may find his simple and direct style normal. And indeed, he makes it work very well. 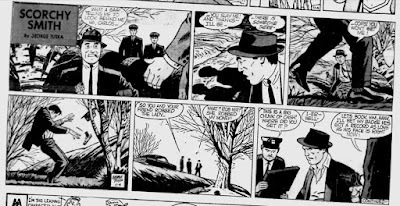 But at that time, most strips were printed larger than in the sixties or indeed the seventies and the eighties, etc, etc. 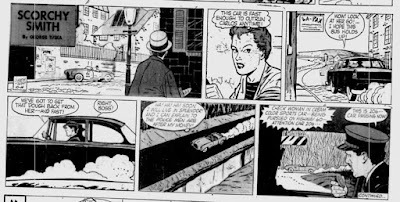 This is the period when The Heart of Juliet Jones started, a strip that could not be printed now (and indeed was hurt very badly by the shrinking process that set in from the late sixties). That Tuska makes it seem so easy, could even have been a bad influence on editors. 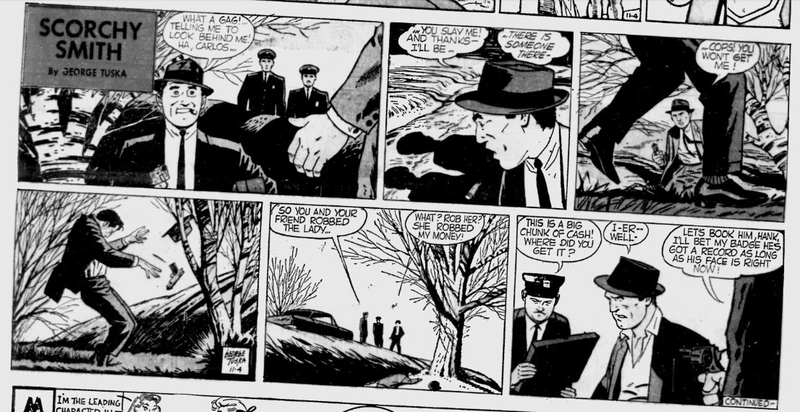 Secondly, I know Tuska could work fast but while doing these, he also did regular comic book work. It would not surprise me if he had an assistant and if so I nominate Pete Morisi, whose construction and facials work so resembles that of Tuska that I never know who influenced whom. 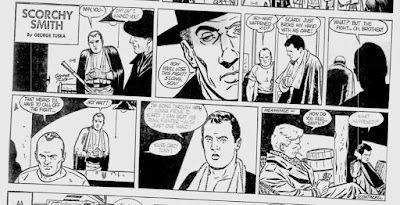 If not, Morisi clearly 'stole' a lot of stuff from his friend Tuska for his own comic book work at that time. 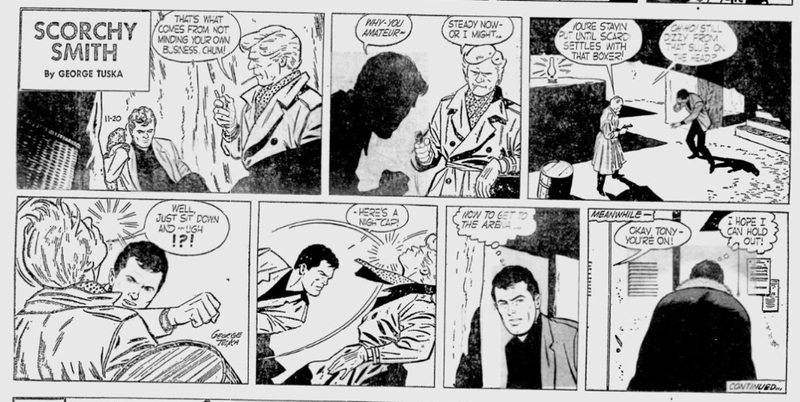 Thirdly, in this run of Tuska Scorchy Smith is changed from a space pilot to a military pilot/secret agent. In the last story he encounters a spaceship again, but at the end it turns out to have been a dream. Hev fun and share. 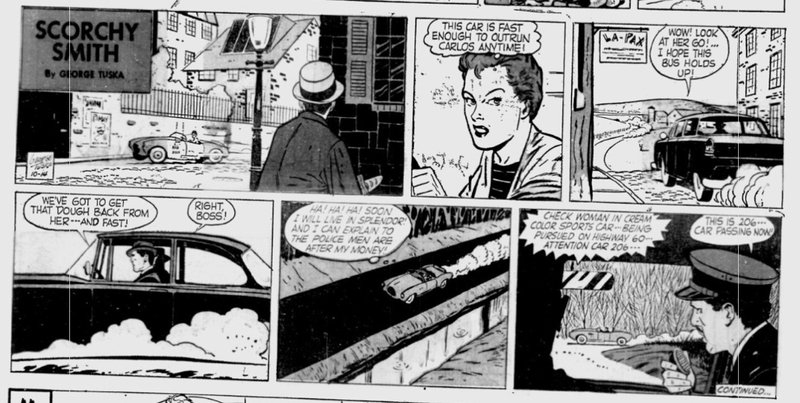 If anypne anywhere has color samples of the Sundays or a more complete run of the dailies, please contact me.